Holding a dumbbell in each hand, sit on a bench inclined at 45 degrees and rest each dumbbell on a knee. 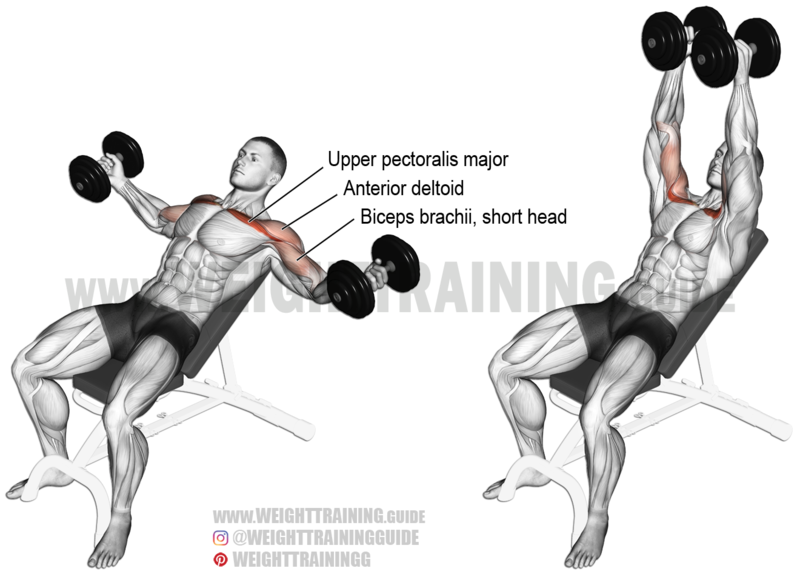 Lie backward, and as you do so, kick the dumbbells up into position over your chest, one at a time. Keeping your elbows locked, inhale as you lower the dumbbells to your sides in an arcing motion until you feel a mild stretch in your chest or shoulders. Exhale as you reverse the motion and press the dumbbells back up to the starting position. Internally rotating your shoulders will serve to better isolate your pectoralis major because the origin and insertion of the muscle are brought into better alignment. When you have finished, bring your knees up and gently lower the dumbbells down onto your knees, which will help you to sit up. Do not go very heavy with the incline dumbbell fly or any other type of fly exercise because doing so can be dangerous. See also the incline cable fly and the dumbbell fly. Helpful post as always. Always learn something new on this site. The incline dumbbell fly is the first exercise I ever did at the gym 25 years ago!